TRANSPORT Heritage NSW, the body responsible for the care of Australia’s famous ‘C38’ Pacific No. 3801, has reaffirmed its commitment to ensuring the streamlined locomotive returns to action next year after an 11-year absence. No. 3801 is often regarded as Australia’s answer to Flying Scotsman in fame terms and, like its UK counterpart, the course of the ‘C38’s’ overhaul has not been without its problems. A number of technical issues were identified with the new-welded boiler, built in 2010 by Deutsche Bahn Meiningen Steam Locomotive Works, in Germany, which meant it did not comply with Australian standards. The Office of Rail Heritage, which was conducting the overhaul at the time, returned the boiler to Germany for rectification in 2011. 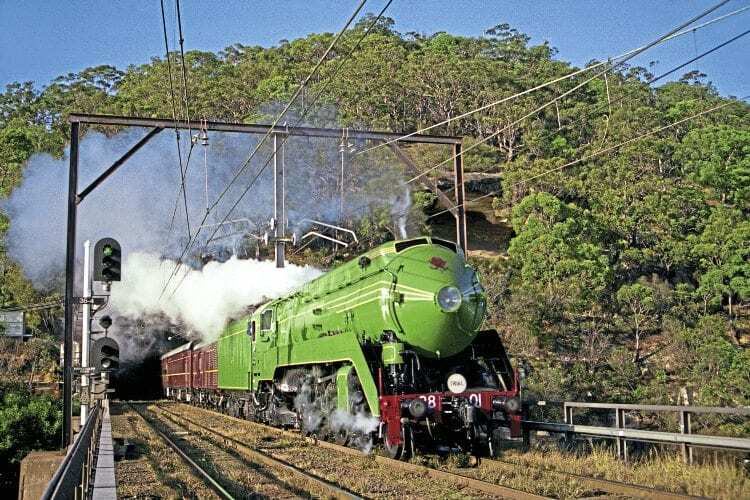 However, after Transport Heritage NSW (THNSW) inherited the project following its formation in 2014, it was decided to bring the new boiler back to Australia so it could be re-assessed. It returned in 2015, when THNSW specialists conducted thorough inspections of both the German boiler and No. 3801’s original NSWGR riveted boiler. After weighing up the options, detailed plans were developed to repair the original riveted boiler, which is currently with an external contractor, Ainsworth Engineering in Goulburn, NSW. The level of work required has been extensive, a new firebox backplate having recently been forged and fitted.